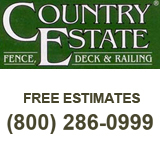 Country Estate Fence Company, Inc. offers Southern California’s best value in vinyl fencing. In addition to offering the highest quality co-extruded vinyl materials available today, we provide excellent customer service, flawless craftsmanship, competitive pricing, and unparalleled industry knowledge. We’ve been in business since 1984 and have completed more vinyl fence installations than any other fencing contractor on the West Coast. In fact, we have experience selling, customizing, and installing vinyl fences, gates, decks, railings, gazebos, and patio covers, as well as aluminum and glass fences and gates, for more than 100,000 satisfied residential and commercial customers. Additionally, we hold an active C-13 fencing and B-General Builder contractor licenses, carry a comprehensive insurance policy, and are fully bonded.